Finally, just shy of forty years old, Linny Taylor is living the life of her dreams in her charming hometown of Willow Hill, North Carolina. The past few years have been anything but a fairy tale: Left broke by her con man late-husband, Linny has struggled to rebuild her life from scratch. Then she met Jack Avery, the town’s much-adored veterinarian. 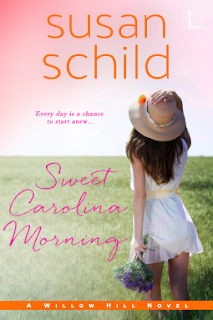 Sweet Carolina Morning takes up Linny's story from the first book about her, Linny's Sweet Dream List. It is all about that pre-wedding time, as many know it is a time that can be busy, lots of decisions to be made and tensions to be dealt with. For Linny that is exactly what it is. She is going into her third wedding, her two previous husbands having left her.... by dying! Her new business is humming along, but her relationship with Jack has turned a bit rocky. The ex-wife is certainly a burr that irritates, as she not so subtly tries to steer Jack and her son - pre-teen Neal, away from Linnie. However Linnie is working really hard to form a relationship with him. But it is not all plain sailing. As well Jack's parents are something else and it could be said rather a challenge, but maybe they will come round. Jack himself is torn, as his son starts to struggle in school Vera is ex wife is trying to say that it is the stress of the pending marriage of Jack and Linny. At times I wanted to shake both Jack and Linny! Jack because he seems to be ignoring Linny's needs, and Linny because she is so anxious and hyper worried, especially about her own mother who just seems to be having a ball. Slowly plans for the wedding start to come together and while it might not be a traditional one it is promising to be memorable. A crisis over Kate - Linny's sister brings things to a head and everyone involved starts to do a little thinking and re-evaluating and before you know it that happy, blended family that Linny dreams of just might be a possibility. I enjoyed reading on in Linny's story, seeing what came next after the engagement... the challenges, the heart searching, the ups and the downs. I look forward to what might happen to her in the next book planned, Sweet Southern Hearts. I like that the story covers post engagement. So often books end at the proposal even though most of the real challenges crop up after! I'll have to look for this one! Sounds like an entertaining novel - I'll look for it! Kathryn this looks super. I've got book one on my wish list!